When you have an excess of outdoor space, but lack enough usable space for you and your family or for entertaining inside the house, it is time to consider a Home Extension. An extension is simply a room that will enable you to maximise the use of your outdoor space in the manner that is the most beneficial to you. You select what type of room that you wish to add onto the house according to your own circumstances. Professionals will bring your ideas to fruition. • Additional interior rooms such as a bedroom, bathroom or playroom are just a few examples of these rooms. Maybe you need a larger dining area instead, though, and this is also a viable option. • Alfresco rooms are halfway between inside and outdoor areas as they are decorated similar to inside rooms, but are located in such a way as to open onto the yard. 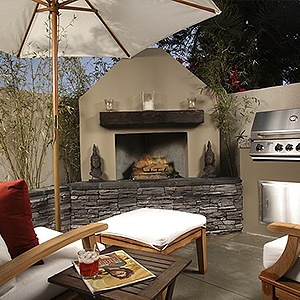 A cooking area, outdoor furniture, LED lighting and possibly a fire pit are popular features of alfresco extensions. With these rooms, you extend your living area into the outdoors where you will be able to enjoy nature. • Sunrooms have two or three glass walls and can also have a glass ceiling. You can utilise a sunroom to grow plants, admire the view of the yard, sunbathe or relax and read a book. Rooms such as these also provide an additional gathering place for family, guests and friends. • A storage room is at times necessary as a family outgrows the existing space in a house. You can place memorabilia, seasonal decorations and other items that you do not use daily in the room. When you add this type of Home Extension to the house, you can organize the rest of your home efficiently since you will gain additional storage. • An attached garage is an effective utilisation of your outdoor space as it protects your vehicle along with other items such as lawn-maintenance equipment. Depending on the available space, you may select a single-vehicle version or one that allows plenty of space for multiple vehicles. You want to ensure that only a professional company builds your Home Extension for you. After all, you desire a quality house addition that will last for a very long time. On top of this, there are local codes to consider during construction.